The season of Benedict XVI’s Papal reign is passing. Now, late in the day, a dark specter has appeared in the form of a major financial scandal swirling around the Vatican bank. The Pope seems uninterested in dealing with such issues. 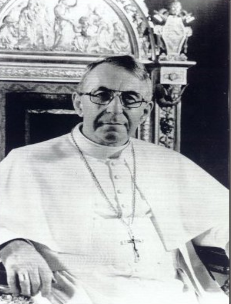 Maybe, rightly so, for in the not too distant past, John Paul I suddenly died when he attempted to look into the then current scandals at the Banco Ambrosiano. Reportedly, Benedict XVI has retreated to his library. Is he safe there from the power struggles, and perhaps deadly intrigues that now surround him? Is it there that he will deal truthfully with the deceptions that he, as Cardinal Ratzinger and now, also as Pope, has perpetrated? These factors are dealt with in our article called, “Is the Pope in Jeopardy?” I ask that you study the article and forward it to others. It is below. I request also, if possible, that you post it on your Website. Thank you. The real life drama that is happening has been called a time bomb about to explode. Yet, it is reported that the Pope seems not up to meeting the crisis, an opinion that recent photographs of him corroborate. Some news sources speak of various mysterious scheming against the Pope as the reason why these calamities have come upon Benedict XVI while others are adamant that the Pope should be using his power more actively by taking charge of the situation. The Australian reports that “...Benedict XVI, 85, implicitly denounced the leaks as the work of the devil.”6 The Pope is undoubtedly right on that score, but not primarily from the causes that are presently being named. Rather from a biblical perspective, the real starting point and reasons for the Pope’s woes are to be found elsewhere. This identification of “Sacramental grace” with the Holy Spirit of God is a formal and explicit sin against the Holy Spirit and must therefore bear the consequences of such a sin. Ratzinger not only published the statement, he has taught the same publicly. For example, when he as Pope gave a message for World Youth Day in 2008, he said, “[T]he Holy Spirit is the ‘soul,’ the vital breath of Christian life itself, through the sacraments of Christian initiation — Baptism, Confirmation and the Eucharist.”11 Thus instead of teaching that salvation of God is directly given by grace alone, received through faith alone and in Christ alone, the Pope formally ascribed salvation as coming circuitously from the Catholic Church through three papal sacraments. In attributing to these three papal sacraments the Holy Spirit’s life-giving power of grace, the Pope has again blasphemed the Holy Spirit. The consequence of such an official dogma is inevitable. Blasphemy against the Holy Spirit is by its very nature an eternal, damnable sin. Who is this Pope in so much Turmoil? 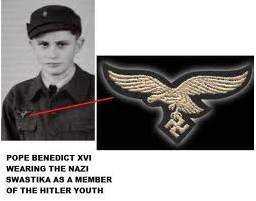 Joseph Ratzinger was born into a traditional Bavarian farming family in 1927. At the age of 14, he joined the Hitler Youth, as was required of young Germans of the time. Later he was drafted into an anti-aircraft unit in Munich. He deserted the German army towards the end of the war and was briefly held as a prisoner of war by the Allies in 1945. He was ordained a priest of Munich in 1951. Later, he taught at the University of Bonn from 1959, and in 1966, took a chair in dogmatic theology at the University of Tuebingen. In 1969, he moved to Regensburg University in his native Bavaria and rose to become its dean and vice president. In March 1977, he was appointed Archbishop of Munich. Then in June 1977, Pope Paul VI appointed him Cardinal of Munich. In Rome, 23 years later, he was appointed the head of The Congregation for the Doctrine of the Faith.12 In that position, Ratzinger issued an official Papal decree called “Dominus Iesus.” In Section 16 of “Dominus Iesus,”13 he asserted that, “The fullness of Christ’s salvific mystery belongs also to the Church, inseparably united to her Lord.” And, “The Lord Jesus, the only Saviour, did not only establish a simple community of disciples, but constituted the Church as a salvific mystery: he himself is in the Church...” Ratzinger’s claim that Christ’s salvation belongs to — and is “in” the Catholic Church — is a damnable lie. Moreover, Ratzinger had already alleged that, “Justification is conferred in Baptism, the sacrament of faith. It conforms us to the righteousness of God, who makes us inwardly just by the power of his mercy.”14 Such a concept of a supposed inner righteousness by means of a physical sacrament is a lie. The risen Christ proclaimed, “He that believeth and is baptized shall be saved: but he that believeth not shall be damned.”15 Faith is absolutely necessary for salvation; baptism is an ordinance that follows it. Thus, Ratzinger’s dogma in “Dominus Iesus,” that the “fullness of Christ’s salvific mystery” belongs to the Church of Rome, was and is a soul-damning lie. He was again attempting to substitute the Catholic Church for the Person and saving work of the Lord Jesus. Finally, at age 78, Ratzinger was elected Pope. Thus, on April 19, 2005, Cardinal Joseph Ratzinger became Pope Benedict XVI. From the position of Supreme Roman Pontiff, he continued to decree dogma, while at the same time upholding the dogmas he had already published in the Catechism. One of these key dogmas is his alleged claim that the Catholic Church can forgive absolutely all manner of sins, no matter how serious. The exact words of his decree are, “There is no offense, however serious, that the Church cannot forgive.”16 While he still claims that his Church can forgive all offenses no matter how serious, a most pertinent question must be answered: can his Catholic Church forgive his own sin against the Holy Spirit? Or asked differently, can Ratzinger’s sin of blaspheming the Holy Spirit be forgiven by his decree that the Catholic Church can forgive all sins? Serious major problems have been stirring up intense turmoil within the Vatican. 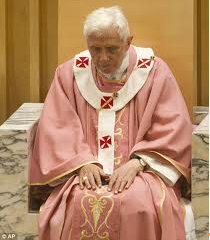 Many ask the question: how will Benedict XVI be able to survive? It may be that he is fearful for his life in a number of ways. Regarding corruption in financial matters, it is undoubtedly on his mind that Pope John Paul I was only one month in office when he died while addressing Vatican bank corruption charges at the time. 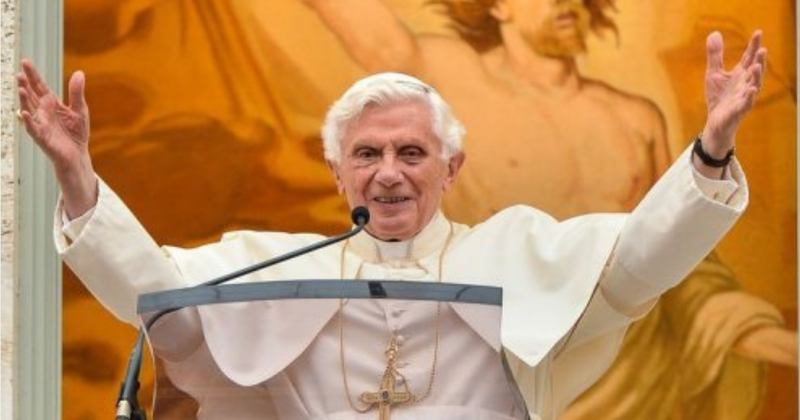 The Catholic New service Zenit reported that Ratzinger at the time said that, “his death was totally unexpected....at the time of his election, John Paul I seemed to enjoy good health.”18 Ratzinger was a key figure in the Vatican at the time and certainly knows the facts. He would also know of strange deaths of other Popes. For example, just a few of the many alleged murders of popes include Stephen VII (896-897) strangled; Stephen IX (939-942) mutilated; John XII (955-964) murdered; Benedict VI (973-974) strangled; John XIV (983-984) starved or directly murdered; Gregory V (996-999) poisoned; Clement II (1046-1047) poisoned; Damasus II (1048) murdered; Pope Pius XI (1922-1929) assassinated. The Lord withstood the fanatically devout Pharisees with a very strong warning. They were looking to their own traditions and self-righteousness as ground for acceptance with God. Because they did not believe that the Lord Jesus was the Savior, He confronted them with the words, “ye shall die in your sins: for if ye believe not that I am he, ye shall die in your sins.”21 Like the Pharisees, present-day Catholics keenly believe in the traditions of their Church and its dogmas, such as the dogmas of Pope Benedict XVI. Thus, like the Pharisees of old, the Lord’s warning applies to Catholics and all other unbelievers. Catechism of the Catholic Church (1994), Para. 882 Hereafter referred to as Catechism. Formerly known as the Office of the Inquisition, then the Holy Office, it is still housed in the same building in Rome as it had been during six horrendous centuries of torture and death when it carried out the Papal decrees.